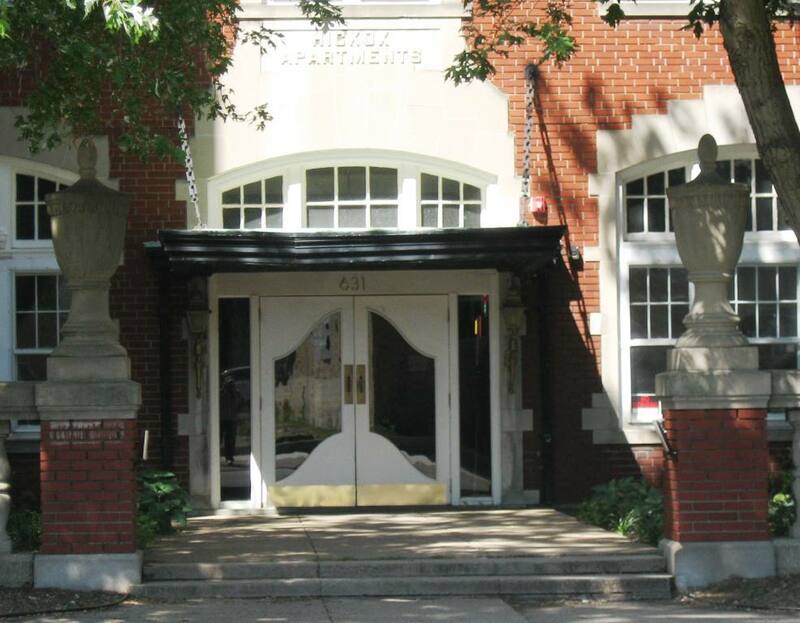 The Hickox Apartments, built at Fourth and Cook streets beginning in the mid-1920s, are a five-building, 100-unit complex that “brought social respectability to apartment living” in Springfield, according to Fever River Research’s 2003 study of the Aristocracy Hill neighborhood. Builder Harris “Buzz” Hickox (1889-1972) began with a row of three-story buildings that appear to have been opened to tenants in June 1926. Those were followed by a five-story courtyard building in about 1930. “The later building consisted of small efficiency apartments designed for the single professional worker and childless couples. It was equipped with large formal lobbies for receiving visitors,” Fever River reported. “… These apartment buildings had such space-saving features as tiny kitchens and fold-up ‘Murphy Beds. '” The new units also offered central refrigeration, window washing and laundry and maid service. “The combination of Hickox’s social status, the location near the Executive Mansion, modern design, and sound maintenance allowed the complex to endure,” Fever River concluded. The Hickox Apartments were added to the National Register of Historic Places in 1984. This entry was posted in Buildings, Fever River and tagged Apartments, Executive Mansion. Bookmark the permalink. The first of the five Hickox buildings, 614 S 4th, was actually built in 1917. Of the three buildings which stand in on row on the east side of 4th between Cook and Edwards, Harris Hickox himself lived in the northern most of the three. John: Thanks for the update. I was aware that the 614 building had been built somewhat earlier, but didn’t realize that it, or the other east-side buildings, were considered part of “the Hickox apartments” as we usually know them, since they’re on the opposite side of the street. Some portion of the Hickox family also lived earlier in the 800 block of South Fourth. I need to go back to that block just to orient myself better. And this is another case where the temporary shutdown of the Sangamon Valley Collection leaves me hanging … I’ll try to do a better, fuller update as soon as the SVC reopens. P.S. And while I’m at it, can you point me to any other sources for info on the Hickox buildings, east and west sides of Fourth? Thanks again. My first apartment was in the Hickox apartments on the East side of Fourth Street (1981). They are wonderfully spacious!! I loved living there, but had an issue with a fellow tenant; so I moved. It’s been years ago, but I fond memories of that place. Does anyone know who to contact to find out about renting one of these apartments?